Well, isn't this exciting—I finally get to introduce the man himself,Professor Brian Bird. Brian is a man of many roles: the business owner, the coach, the husband, the father, the friend… and did you know he is an avid fly fisherman? Brian has always been a visionary; he is the happiest when he is planning something and he is the one who takes it to the next level. He does this with everything he is involved in. When you have known someone for so long, you get to appreciate the many aspects of them. There are so many things about Brian that everyone gets to experience at the gym. He is the most inclusive person I know. He always wants people to feel like they belong or are a part of it, that's the kind of atmosphere he has created at the gym. His generosity spills over to everyone he meets. Especially when he is coaching, he loves seeing a student level up and achieve a goal, master a move or takedown. These are the things that fuel him up. He was a fierce competitor and won at every level. 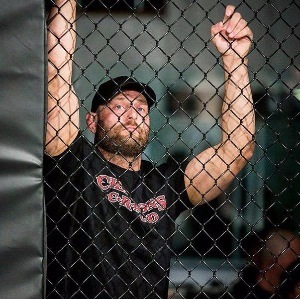 He enjoyed it, but not as much as he does coaching—that is where he excels, sharing his knowledge and skills to inspire a fighter to go for it. Whatever that goal is, Brian is the guy to help you get there. However, if you really want to see this big dude's heart melt, drop into the Little Rollers Class. It's the parent-assisted class on Mondays, and he is there with his son (possible sighting of the cuddle bug). So now you have an understanding of Brian, but let's find out more about Professor Brian and the journey of how Champion's Creed became one of the most trusted names in MMA. Brian’s martial arts journey began in his childhood, trying out different styles available at the time, such as karate or Japanese jiu-jitsu (twisting Wonder Woman into a pretzel). 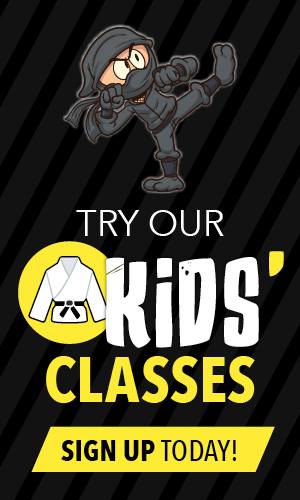 Many students that come to train at our club also began thinking about martial arts at a young age with similar experiences. It was in the year 1995 when Brian actively began focusing his training on Brazilian jiu-jitsu (BJJ), being able to see its effectiveness through the UFC when Royce Gracie was able to beat much larger opponents by using grappling techniques. BJJ was very difficult to come by at that time, so Brian had to learn through any means possible, such as videos, books, and travelling throughout Canada and the U.S. to acquire the knowledge. Brian began training with friends and small groups of people who also wanted to learn Brazilian jiu-jitsu. Brian’s commitment and continued perseverance to learn and share his knowledge eventually transpired into him becoming a leader and instructor, owning and running his own school. In the year 2000 he transitioned from teaching out of rental facilities and other gyms to opening his own academy called National Brazilian Jiu-Jitsu in NW Calgary near SAIT. Since Brian began training in BJJ he was searching for a Black Belt instructor to advance his own knowledge and that of his students. In 2001 the club became an affiliate of Roy Harris, a Black Belt from San Diego. Roy Harris was one of the first Americans to achieve his Black Belt in BJJ. Brian is a Harris International Certified Associate Level Instructor under Roy Harris. 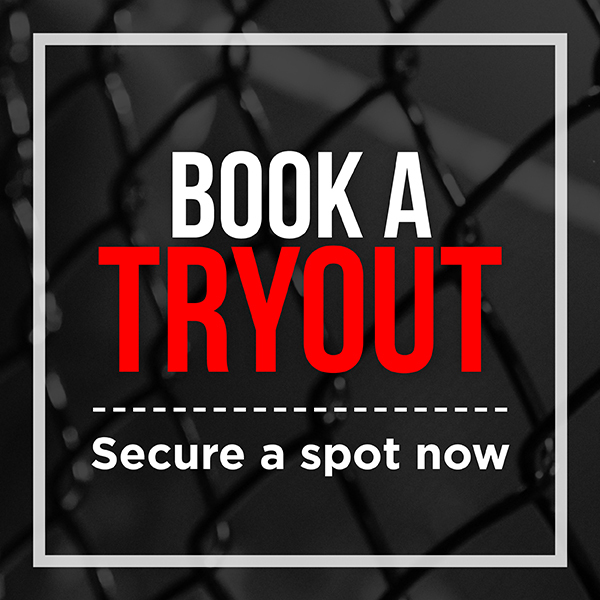 This was how the journey began for Brian and since then he has grown his club to be a successful MMA club with hundreds of students training in BJJ, Muay Thai, wrestling, and MMA. Coached MMA fighter Nick "The Promise" Ring to the UFC (MMA fighting record 12-1). Brian is the only coach to create a UFC fighter in Calgary. 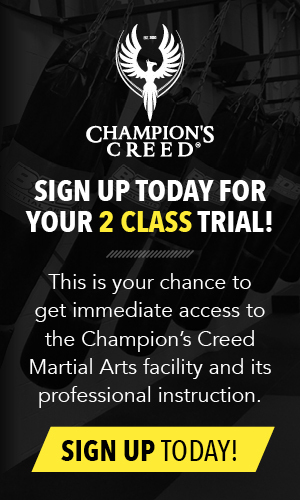 So I know you want to check out Champion's Creed, so come in and say hi to Professor Brian. (If he doesn't answer to that, "hey, dude" works.) Seriously, come in and see what happens when a visionary turns a regular gym into a place for everyone of every level to build confidence and powerful life-changing experiences.